New Books and FREE Books from Amber Cove Pub! To celebrate today’s new releases of Villains Pride by M.K. Gibson and Esoterrorism by C.T. Phipps, Amber Cove Publishing is offering a bunch of Kindle books for free, today through Sunday! If you’ve got a Kindle and want to load up on a bunch a great books for free, today is your day! My publisher, Amber Cove Publishing has all the books below for free. Grab a few and try them out. You just might find your new favorite author. Time to Lie by Phil Taylor: Yes, it’s my book. It’s a humorous, time travel coming of age story. The reviews have been great so far! Get it free on your Kindle today! Villains Rule by M.K. Gibson: Villains Rule is a fantasy action comedy about Jackson Blackwell, the Shadow Master and top villain adviser. Sadly, even the top villain occasionally gets double-crossed. Trapped in one of the fantasy realms, Jackson uses his skill and wits to exploit rules, undermine godly authority, and win the day. Get this for free today and then grab the sequel Villains Pride! To Beat The Devil by M.K. Gibson: Cyberpunk at it’s best! I read this one and loved it. You can read my interview with the author HERE. Prime Suspects by Jim Bernheimer: A Clone Detective Mystery by Jim Bernheimer – A science fiction police mystery in the vein of Blade Runner! Horror, Humor, and Heroes Vol. 4 by Jim Bernheimer: If you enjoy Jim’s D-List Universe, here’s your opportunity to get the new Hillbilly Bobby novella! “Being a supervillain means never having to say you’re sorry . . .” In 2012 I had finished one book on my Kindle and was poking around the “Recommendations For You” section for another good read. I came across Confessions of a D-List Supervillain and I loved it. It was a fun, unique story that had a different feel to it. Since then I’ve read the two sequels that followed Confessions and was eagerly awaiting the fourth in the series. 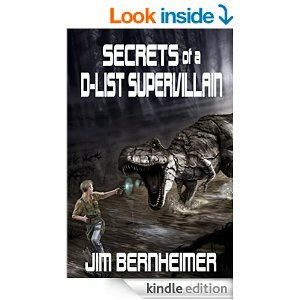 If you haven’t read any of Jim Bernheimer’s D-List Supervillain series, I highly recommend that you get the whole series and enjoy. Jim’s protanganist is Cal Stringel, a down on his luck wanna-be supervillain with a conscience. He is every man. He is who I would probably be if I had the technological know how to make a super suit. He’s like Tony Stark (Iron Man) but without the good looks or millions of dollars. So, on Friday, like a stone cold rapper, Jim Bernheimer dropped Rise of a D-List Supervillain on Amazon overnight. If you’ve read the first three, why haven’t you picked this one up yet? It’s now available for Kindle and in short order it will also be in paperback and on Audible. I truly do enjoy Jim’s books and when I decided to work with a publisher on my next book instead of self-publishing, Jim’s Amber Cove Publishing was the first one on my list and I’m lucky and grateful that Jim and his staff liked my next novel Time To Lie enough that he signed me for that book and the sequel. This next picture is from the table of contents of Rise of a D-List Supervillain. See that? How cool is that? If you buy Rise of a D-List Supervillain for Kindle, you get a two chapter preview of my new book, Time to Lie, which will be out in early September! My friend Jim Bernheimer, whom I had an interview with here just 12 days ago just released the third in his D-List series yesterday. If you like the “down on his luck”, ambiguously moral protagonist, has Jim got a series of books for you! Interview with D-List Author Jim Bernheimer! No, that “D-List” in the title isn’t a dig at Jim, it’s a reference to his hugely popular 2011 self-published novel Confessions of a D-List Supervillain, which chronicles the adventures and misadventures of Calvin Stringel, who goes from climbing the tech corporate ladder to outcast to… I don’t want to give too much away. My story is that Jim’s D-List was the first “indie author” novel I ever read and after asking Jim some questions by e-mail, I was encouraged enough to start my own self-publishing journey. Jim however hasn’t stopped after D-List. He has a whole catalog of interesting novels. Jim’s newest novel is the prequel to D-List, titled appropriately enough Origins of a D-List Supervillain. Jim was one of my first author interviews in 2013 and was kind enough to come back. TPF: Jim, thanks for agreeing to a return visit on The Phil Factor. Jim, now that I’ve done more writing, I find that I put a little bit of me into the protagonist of each of my books. Is that the case with you, and if so, which of your characters has the most similarities to you? Jim: Most of my main characters are rather cynical. I’m probably closer to Mike Ross of the Dead Eye series than Cal Stringel from the D-List Supervillain in my level of cynicism. TPF: Jim, I know that your wife grew up in western New York. How did she feel about the cheap shot you took at the Buffalo Bills in Origins? Aside from this question, have you gotten flack from others about that? Jim: Nah. I’m a Bills fan too. We all suffer together. Sometimes at conventions, I’ll wear a Buffalo Bills polo shirt I have and occasionally people will actually stop because of it and talk football. I’ll joke that it is part of my cosplay as a disgruntled Bills fan. Even though we’re 7-6 right now, that remaining schedule doesn’t look promising to get into the postseason. TPF: Rather than make the main character in your D-List books either a hero or a villain you give him a bit of both. Was that the plan when you started or did it evolve as you created the story? Jim: I always wanted to write a well done anti-hero. Cal Stringel is that guy. Back in the 80’s (now I feel old), I used to love watching Starblazers. My favorite character – Desslok because he was my first real introduction to an anti-hero. A quality anti-hero will live by his own code and stay true to himself while still being able to evolve as a character. TPF: Will there be another chapter in the D-List series? Because it’s been so successful for you do you feel obligated to keep it alive? Jim: Well, I’ve just sent Secrets of a D-List Supervillain off to the editor, if that answers the question. It replaced the Dead Eye novel I had planned to write in this slot. To be perfectly honest, if it sells as well as Origins has, Trials of a D-List Supervillain will probably be written next. The series has all the momentum going for it right now. Audible.com bought the rights to the Confessions audio book for the next 5 years, so it’s in their interest to “move” it. At the end of November of this year (2014), they made it the Daily Deal and sure enough I was the number one bestselling audio book on all of audible.com for that day. It’s the third day of December as I’m responding to this and I’m still in the top 5 of all science fiction. That kind of exposure is the kind of thing that has to be taken advantage of. TPF: I’m sure Audible.com is nice, but c’mon, is it Phil Factor type exposure? On your website, jimberheimer.com, you mention that the next chapter in the Dead Eye series may be out this Fall/Winter. Could you tell my readers a little about that storyline and when we, and when I say we I mean me, can look forward to the third book? Jim: Dead Eye 3 is probably more of a summer 2015 release now, especially if D-List 4 bumps it. My plan for Dead Eye 3 is to heavily involve Mike in the supernatural “turf war” taking place from New York City down through New Jersey that was briefly mentioned in the first Dead Eye novel. Mike thinks he’s in a good spot now, but the story mirrors the real world and the Recession of 2008 is about to hammer the spirit who’d planned to employ him. Even ghosts have real world problems in that series. TPF: To be honest Jim, I’ve only read five of your ten books. Could you tell me and The Phil Factor readers a little bit about both your Prime Suspects and Sorceress novels? Jim: Prime Suspects: A Clone Detective Mystery is the story of a clone of a homicide detective created to solve the murder of his prime (original). Complicating matters is the fact that most of the suspects are also clones of the same homicide detective and they know all his tricks! He’s the murder victim, several of the murder suspects and the guy trying to solve the murder all at the same time. It is my attempt to write a noir sci-fi in the vein of Blade Runner (or the source material for that – Do Androids Dream of Electric Sheep). A friend of mine is helping me adapt the novel into a screenplay and I’m eager to see what might come of that! The Spirals of Destiny Series (Book One – Rider and Book Two – Sorceress) are my epic fantasy novels about a young woman (Kayleigh) who bonds with a unicorn (Majherri). It is anything but your normal unicorn and maiden story. When a woman bonds with a unicorn, she’s drafted into the High-King’s Battle Maidens, who are his peacekeepers, his ambassadors, and his enforcers if need be. The odd numbered chapters are written from the unicorn’s point of view and the even numbered ones are from Kayleigh’s. The unicorns are fully functioning characters in the story. They have their own culture, motivations, and emotions. Majherri is the only unicorn to have survived the death of a rider. Normally when a bond is made, the unicorn is the source of the magic and the rider is the control mechanism. If a rider dies, the unicorns magic eventually becomes toxic to the unicorn and they die of a disease called the wasting. Because of Majherri’s survival, he’s a pariah and an outcast, a true broken hero searching for answers and redemption. Kayleigh is his second rider off to The Academy to learn how to become a Battle Maiden. She’s your fish-out-of-water / coming of age story. Their unlikely partnership will have to survive the stirring evil that is stalking the Blessed Continent. This is the second in what I plan to be a regular feature highlighting indie authors. Jim Bernheimer is part of the reason I began my own indie author journey. At this time last year that I discovered his novels, some published by Gryphonwood Press and some on his own imprint, EJB. The stories were unique and had a texture to them that I hadn’t found anywhere else, and I loved the characters immediately. Just as important as good stories is that Jim is a genuinely nice guy who responded to my e-mail last year when I wrote to ask questions about his self-published novels. PT: Jim, first of all, thanks for taking the time for this interview. Like many indie authors you still have a day job that pays the mortgage. Since you’ve been writing, do you think of yourself as an I.T. specialist who writes, or a writer who also happens to be an I.T. specialist? PT: You began your publishing journey in 2009 with the short story collection, Horror, Humor, and Heroes. How did you first publish? Was it through Amazon or did you use some other avenue? JB: Horror, Humor, and Heroes was me testing the waters to see if I could actually write something original. I came out of the world of fan-fiction and don’t try to hide it. It doesn’t necessarily carry the stigma that it used to and I never let it bother me when it did. So, I got my sister-in-law to do the cover art and put it together for publication on Amazon and used Smashwords to get it into the rest of the markets. PT: If you had a time machine and could go back and bestow some wisdom on past Jim before he published that first book, what would you say to him? JB: I would have gone with a pen name. It’s the biggest piece of advice I can offer a new writer and here’s why – these things follow you around on the internet. One of the first places I sent Horror, Humor, and Heroes to a site for review, I chose a site and the reviewer took obvious offense to me being self-published and a fan-fiction writer. It devolved into something approaching a personal attack, but ultimately he used the word “Buttsex” in the title. When you Google me, it shows up, fortunately several pages back these days. Besides the fact that I have two daughters who will probably see it at some point, there is the matter of my day job which involves background checks and a security clearance. I haven’t had to answer a question about it yet, but I wouldn’t be surprised if it pops up one of these days. So, yeah my advice to past me and any others taking this up would be to strongly consider a pen name. PT: How would you classify the genre of most of your novels? PT: If someone were to read all of your published works, which one should they read first and why? JB: It really depends on what the reader’s tastes are. I write high fantasy (Spirals of Destiny), urban fantasy (Dead Eye), science fiction (Clone Detective Mystery), and adventure (D-List Supervillain). When I’m at a convention, I always ask what the person who stops at my table likes to read. If they say Jim Butcher, I start talking about the Dead Eye books first. If they say comics, I go to D-List and so on. Ultimately going by sales, Confessions of a D-List Supervillain has outsold everything else I have. If you go on Amazon (at the time of this writing) and sort by Average Customer rating, it is in the top 50 of all science fiction novels on Amazon. If you go to Science Fiction/Adventure it is number 25 and in the Fantasy/Superhero sub-category it is the top rated novel…numero uno! There’s always going to be someone that will outsell me. I know it. I accept it, but I can smile knowing that I still wrote a damn good book even if it doesn’t have a big publisher behind it. PT: Most of your novels are in series. Which is your favorite and why? JB: Probably D-List (which will eventually be a 4 book series). I’m a sucker for the Anti-hero. He doesn’t always have to be the goody-two-shoes. Cal can be crass and annoying. It’s refreshing to write a character who has flexible moral boundaries. PT: Let’s just say you win a big lottery. Do you give up your day job and write full-time for the rest of your life? JB: Well my Powerball numbers didn’t come up, but if they did, I’d quit and write until I run out of ideas. PT: Can you give us a preview of what you have coming up the rest of this year? JB: Spirals of Destiny Book Two: Sorceress should be done by late summer. 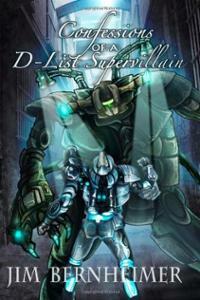 After that, I’m going to write both the prequel and the first sequel to D-List. The prequel will be Origins of a D-List Supervillain and the sequel will be Trials of a D-List Supervillain. I hope to have both of these done before the Christmas shopping season. In 2014, I hope to have the final installment – Fate of a D-List Supervillain done and then return to Mike Ross and the Dead Eye universe. Thanks for your time Jim. I am truly a fan of your books and am looking forward to the new ones later this year. If anyone reading this has contacts in Hollywood, let them know that D-List would make a great feature film and the Dead Eye series would be a great TV series. For readers who want to find some really unique sci-fi, fantasy, and horror Jim’s books are available for e-readers as well as in print. You can find more about Jim and his work at his website JimBerheimer.com and his Amazon page. As always, if you like what you reader here please hit the Facebook and Twitter share buttons below.